All devices that stores energy must at a time overheat, smartphones are not eluded from this reaction. Overheating is common to smartphones either when charging, using or left in a recess mode. One of the most annoying aspects is for your device to be unusually hot without any usage hence draining your battery. Today, we’ll talk about how to handle overheating on your smartphone. 1. Too Many processes (Apps) running at same time – When too many Apps are running on your device background, it will definitely cause it to heat up. In this case, you can download Clean master app; Clean master can remove junk files as well as free up ram by closing unused applications to cool down your smartphone. Otherwise download Greenify if your smartphone is rooted. Greenify is a great tool to manage overheating as well as improve battery life. It can close Facebook and whatsApp which tend to use lot of Ram and at times keep the processor busy with useless work. 2. Only Enabled /WIFI / 3G/ 4G when required – This is a must for all users who are doing a lot of multi-tasking on the smartphones, usually the 2G signals are stronger and phone need to do less work while searching for it. For extended battery life and performance keep your phone on 2G if possible. Turn On WIFI /3G / 4G whenever required it will also reduce load on the smartphone processor and help it cool down faster. 3. 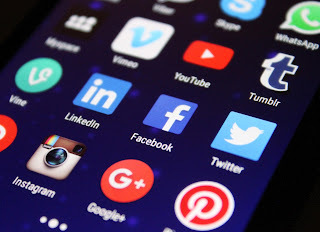 Too Many Apps Installed – More Apps you have on the smartphone more processes continue to run in the background – Apps like Facebook and it’s messenger continue to run background processes. Always get the genuine batteries either by contacting the service center or buy it from an authorized dealer for the mobile brand. 5. Don’t Use the Smartphone when Charging – This is the cardinal rule you must follow, must not play games or use data to watch videos when your smartphone is charging; as processor will come under huge amount of stress and definitely all of the smartphone will heat up due to this. Kombucha tea has a history going back thousands of years. Calling it a tea doesn’t really give it the credit it deserves. The Kombucha culture may use tea and sugar solution as food, but the resulting beverage is far from simple tea. In fact, historically, Kombucha has been referred to as the Elixir of Life or The Remedy for Immortality in the first recorded use of the tea during the Tsin Dynasty, 221 B.C. This article is not about the history of Kombucha or the benefits of Kombucha, but rather about how to make Kombucha tea. I hope that the instructions with pictures are helpful. In preparation to make Kombucha tea, one must have ready a few simple items and to keep in mind to use only glass and plastic, not metal. 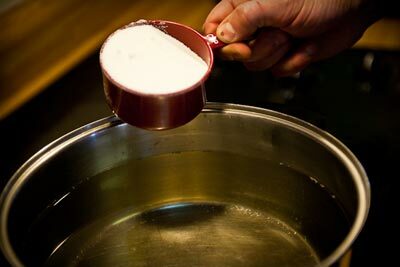 Clean pure water will be heated to boiling on a stove, at which time a specific amount of sugar will be added. Heat is turned off and sugar mixture stirred to ensure it’s completely dissolved. Tea bags are added and allowed to steep until water has cooled naturally. Once at room temperature, the sugary tea mixture is transferred from heating pot to a glass container where it will remain undisturbed for an entire week. Kombucha starter mixture is added into the liquid and stirred gently. 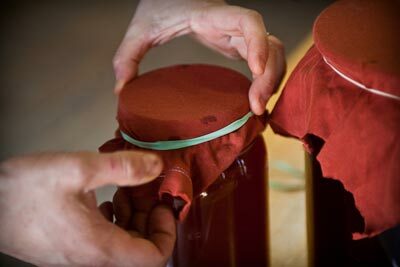 Kombucha culture (SCOBY) is placed in the mixture, cloth material is placed over the opening and fastened in place with a rubber band. Place glass container in a spot that can remain undisturbed during its transformation time and leave sit for at least 7 days. 1. Heat your desired amount of pure clean water to boiling – I personally use and recommend distilled water, but reverse osmosis (ro) water would be fine too. I use distilled water because it’s just H2O and nothing else. Once boiled, remove from heat. No picture of this, because it would be pretty boring. Imagine a pot of hot water. 2. 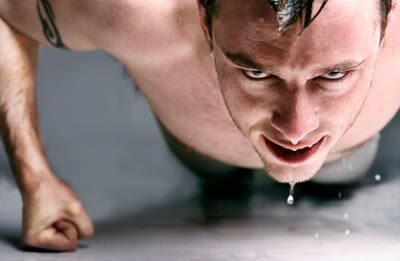 Add Sugar – Use 1 to 1.5 cups of white sugar for every gallon of water. A gallon is 4 litres more or less (it’s not really, but it’s close enough). In metric, the numbers are thus: 2 to 3 ounces for each litre, or 8 to 12 ounces per gallon. Stir the sugar until it’s completely dissolved. Then stir a little more. Sugar is the food source for the Kombucha culture and is consumed during fermentation. 3. Add the tea bags – For best results, use only black tea. 2 tea bags per litre, or 8 per gallon. Tea adds nitrogen for the culture, allowing it a happy environment to produce the beverage. Steep the tea until the mixture cools, so basically put them in and walk away. Once cooled to room temperature, wring the bags out into the mixture and discard. 4. Pour sugar tea solution into clean glass container – Pour nearly to top, leaving room for a little Kombucha starter solution to be added. 5. Test the temperature – make sure that the sugary tea solution has cooled to room temperature. 6. Add the Kombucha starter – You should already have starter Kombucha from a previous batch or from a friend who’s provided it. 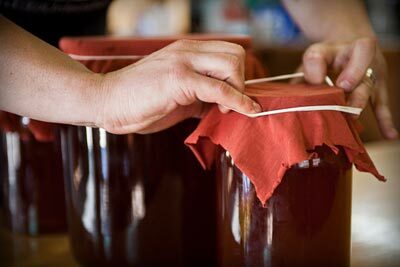 It’s possible to begin Kombucha from scratch using some starter, but it takes a little longer and requires more care. How much Kombucha starter to begin with depends on how much Kombucha you’re making. Ideally, you should use 10 to 25% of the final amount desired. 1 cup per litre for example. Kombucha loves a sugary, nitrogen filled, low pH environment. The starter should be on the lower end of the pH scale (more like vinegar) when added to your new batch. See my article on Best Way to Make Kombucha for more info on pristine conditions. 7. 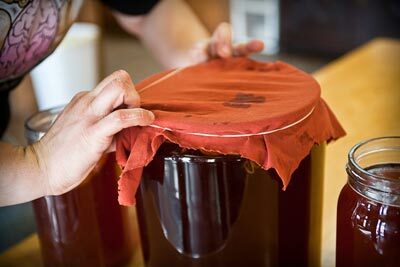 Add the live Kombucha culture (SCOBY) to the mixture – take careful consideration of the temperature you’re putting the SCOBY into before making this move. The bacteria yeast culture is very temperature sensitive. Your mixture should be at room temperature, or slightly above. Best fermenting temperatures are between 21 and 29 degrees Celsius. This was the first time I used this 2 gallon glass container so I added 3 scoby’s from my previous smaller batches. 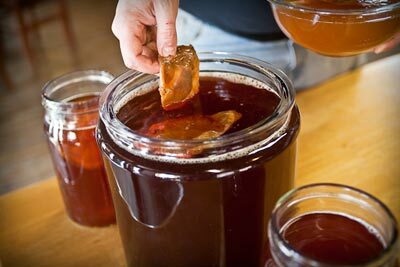 In the background, you can see my starter Kombucha tea with a few scoby’s in it. 8. Cover the container – The container must be allowed to breathe, but not allow anything into it. 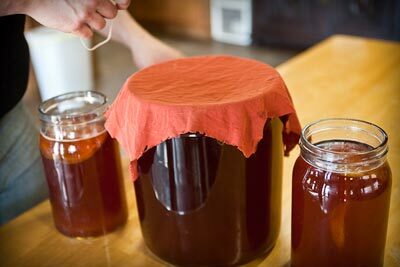 Fruit flies love Kombucha tea, so cover it with a cloth material that allows air to move back and forth, but nothing in. I used cheese cloth originally, but was told that fruit flies could still get through it. Consider cutting up an old shirt, measuring before you cut so that the piece fits over the top. A wider mouth opening allows for better air exposure and a better fermentation. 9. Use a rubber band to seal the material on top. 10. Place in a warm area and allow to ferment – Avoid direct sunlight, but allow for room temperature to above room temperature conditions, and allow for an undisturbed setting for at least a week. Fermentation times vary according to conditions, but a week is typical. Kombucha loves warmth, and goes dormant in the cold. Ideal conditions are 21 to 29 degrees Celsius. Direct sunlight can harm the culture and reduce its life span, but it does not need to be kept away from light, just direct sunlight. You’re going to need bottles to store the finished product, so begin collecting them over the week while the Kombucha is fermenting. Glass bottles are preferred and should be able to be capped with a strong fitting. Wine bottles with screw tops work well as are specialty beer bottles with the resealable corking system. Canadian Pellegrino sparkling water bottles come with a screw top, but US versions have single use caps. Rubber corked wine bottles can be re-used but be aware that Kombucha under pressure can push through the cork or even pop them out. This happened one time in our RV and scared the crap out of my cat! 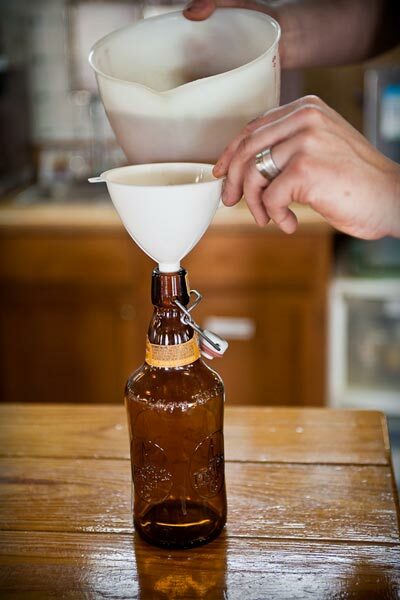 Also, a funnel is considered a good tool to assist in bottling Kombucha, so find and purchase a funnel if you don’t already have one. 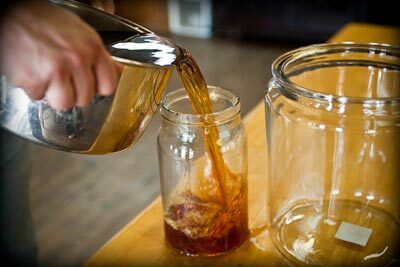 Starting with a very sugary tea mixture, the Kombucha culture consumes the sugar over time into the beverage we drink. Over the course of 4 to 14 days (or more), the beverage becomes lower and lower pH (more acidic) and moves from sweet to sour. Knowing when to bottle Kombucha is based both on taste and on desired health benefits. Gunther Frank and I both agree that drinking Kombucha should be based on health benefits first and taste second. Good Kombucha tea should taste like a cross between apple cider and apple cider vinegar. Somewhere around the 7 day mark, pour off a few ounces of tea and taste it. See if it’s to your liking. When you do this test with your first batch, it would be hard to discern between sweetness levels, not having experienced how sour it can become. Simply make a judgement call and go with it. If it’s too sweet yet, leave it another day and test again. Bottling for the purpose of this article is very straight forward. I like bottles that have the resealable corking systems like this beer bottle but any glass bottle will suffice. I’ve found beer bottles like this one in two different sizes. This is the smaller of the two. Pour the tea into your bottles but save 10 to 25% for your next batch. Keep the SCOBY culture with this starter tea. If you aren’t able to make more for a few days or longer, cover and put in the fridge. It will become lower pH and more vinegary, perfect for your next batch of tea. 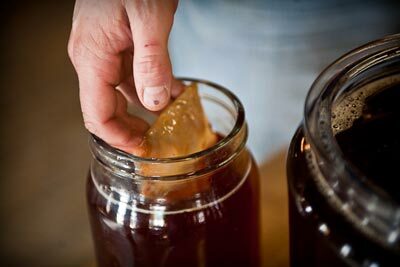 The Kombucha SCOBY may float on the surface of your jar, or it may sink to the bottom. Either way is fine and a new baby SCOBY will form on the top of your working mixture. They may join together producing a thicker and thicker culture. This is normal. 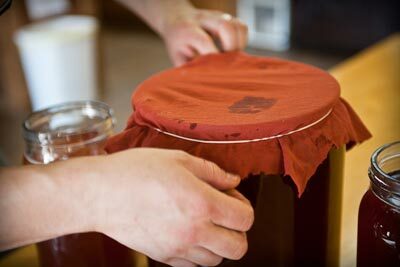 Treat your SCOBY with care. It’s heat sensitive. If you aren’t using it for an extended period of time, keep it with a little starter and put it in the fridge in it’s own container. Preferably glass. 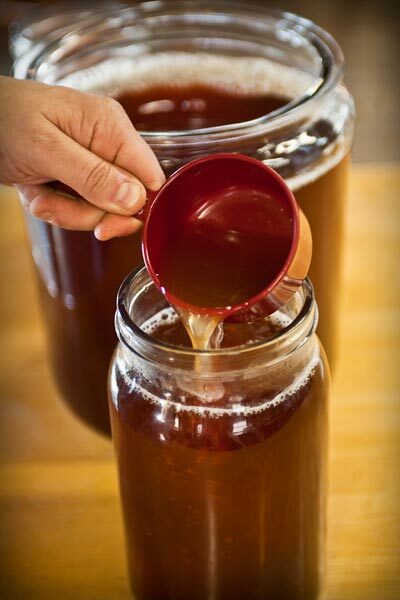 It’s best to start with smaller quantities of Kombucha, no larger than 2 litres (half a gallon) until your SCOBY becomes more robust and able to handle larger amounts. Virtually all breakfast cereals are to be avoided – they almost always contain high levels of calories, sugar and non-existent protein and fiber content – the worst possible type of food. COSGROVE: the only cereal you can have is oatmeal. Nothing else.